Owen Farrell (right) faced criticism for his leadership in England's Six Nations draw with ScotlandEngland skipper Owen Farrell will develop into a world-class captain, according to the Rugby Football Union's leadership consultant Will Carling. 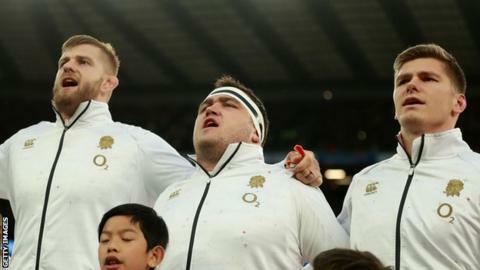 Fly-half Farrell is expected to lead England into this year's World Cup despite concerns that his workload is too heavy.Carling, who captained England to three Grand Slams in the 1990s, says Farrell, 27, will need help from senior players. [/i]"Farrell needs help and support from his senior players - and he will get it. "Farrell's leadership credentials were questioned after England's final game of the Six Nations, when they relinquished a 31-0 lead to Scotland before rescuing a 38-38 draw. Former England stand-off Paul Grayson is among those concerned the Saracen may be overloaded, given he is the team's captain, playmaker and goal-kicker.But Carling feels Farrell can cope with the pressure and will lean on other experienced players.Lock Maro Itoje, scrum-half Ben Youngs and fellow number 10 George Ford are among those in England's wider leadership group. "Why do pundits think leadership and fortunes of a team rest with one man?" continued Carling, who joined Eddie Jones' management team at the end of last year. "Farrell is a fearsome competitor - a young captain with a real desire to learn and improve. "I might be biased, but he has all the traits that I would follow. "The man is a world-class player and just needs time before he is the same as a captain."